Winning a title fight against a worthy, not handpicked, opponent is tough enough. Doing so in the other guy’s country is even tougher. Such was the case this year with Carl Frampton of Northern Ireland. He took on Scott Quigg in Quigg’s native Lancashire, England in a super bantamweight title-unification bout on Feb. 27, broke Quigg’s jaw and came away with a split-decision victory before about 20,000 at Manchester Arena. What Frampton did July 30 was even more impressive. He moved up in weight and challenged Leo Santa Cruz of Lincoln Heights for his featherweight belt at Barclays Center in Brooklyn. Frampton (23-0, 14 KOs) took Santa Cruz’s title via majority decision, handing Santa Cruz his first loss. 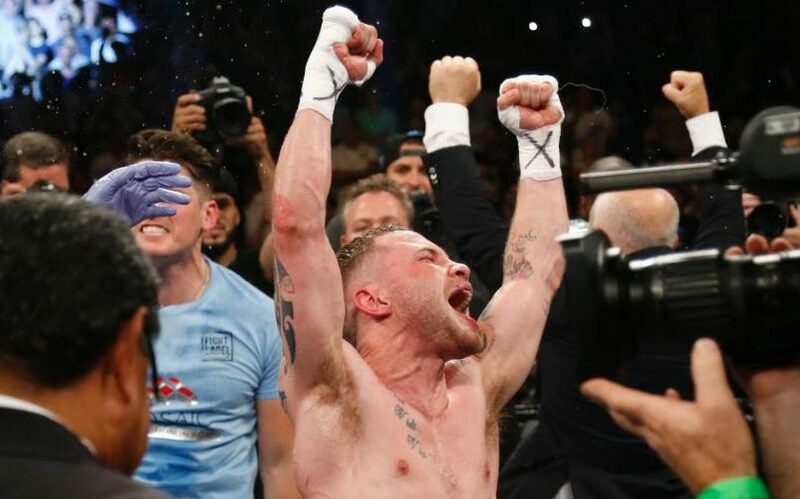 For his work, Frampton is this newspaper’s Fighter of the Year. He still gets goosebumps when discussing his win over Santa Cruz, who entered that bout 32-0-1 with world titles in three weight classes. “Headlining in New York against a great fighter like Leo Santa Cruz was a dream come true,” said Frampton, who Jan. 28 will take on Santa Cruz in a rematch at MGM Grand in Las Vegas (on Showtime). “Now I have the opportunity to go to Las Vegas, where Leo has fought a few times. Frampton believes he has become a very popular fighter, not just in his homeland. He had quite a few fans rooting him on at Barclays Center, thanks to New York City’s Irish population. He said he realizes that Santa Cruz being from the L.A. area, he’ll bring more of his fans to Las Vegas than he did to New York City. Frampton doesn’t seem to care, though, and that’s what makes him the fighter he’s become. If you love boxing, you love that kind of talk, that kind of fearlessness. You probably won’t see many fights that end in a draw end up as our Fight of the Year. Nevertheless, the June 4 bout between super featherweight champion Francisco Vargas of Mexico and countryman Orlando Salido gets the nod. That it was contested at StubHub Center in Carson was no surprise because that outdoor venue has been bringing out the ferocity in fighters for years. This was no different as the two went at one another with reckless abandon, showing no regard for personal safety. When it was over, Vargas had retained his title because of the majority draw. He was happy with the decision. Salido thought he won. Ultimately, no one lost in the ring, nor out of it as the 7,378 in attendance were treated to one heck of a ring war. When featherweight Oscar Valdez of Mexico and super bantamweight Jessie Magdaleno of Las Vegas entered 2016, neither was a world champion. They are now, thanks in part to Manny Robles, who is our Trainer of the Year. Robles, who trains fighters out of the Rock Gym in Carson, guided Valdez (21-0, 19 KOs) to a world title when Valdez stopped Matias Rueda of Argentina in the second round on July 23 at MGM Grand. Then came Nov. 5 at Thomas & Mack Center in Las Vegas. It was a night Robles won’t soon forget. On the Manny Pacquiao-Jessie Vargas undercard, Robles was in Magdaleno’s corner when he upset Nonito Donaire via unanimous decision, taking Donaire’s championship. This was Robles’ first fight with Magdaleno (24-0, 17 KOs), so this victory was ultra-impressive. Only minutes later, Robles was in Valdez’s corner when he defended his title with a seventh-round TKO of Hiroshige Osawa of Japan. That’s not to mention Robles has done good work with middleweight contender Jason Quigley (12-0, 10 KOs) of Ireland. He is just mowing opponents down in vicious fashion. Of course, I didn’t see every fight in the world this year. But in researching this subject, the Dec. 17 middleweight bout between Hassan N’Dam and Alfonso Blanco of Venezuela in N’Dam’s native France sticks out. About 20 seconds in, N’Dam caught Blanco with a right cross on the chin. Blanco fell face first, his legs then twitching as the referee waved off the bout. It was reminiscent of Pacquiao getting knocked cold and falling on his face after being crushed by a Juan Manuel Marquez right cross in their December 2012 fight. We are two weeks out from the Jan. 14 super middleweight title-unification bout between Badou Jack (20-1-2, 12 KOs) of Sweden and James DeGale (23-1, 14 KOs) of London at Barclays Center in Brooklyn (on Showtime). … The main undercard bout for the Santa Cruz-Frampton remtach will see Mikey Garcia (35-0, 29 KOs) of Oxnard challenging Dejan Zlaticanin (22-0, 15 KOs) of Montenegro for his lightweight title. Garcia has won titles at featherweight and super featherweight. Jessie Magdaleno/Photo courtesy of Top Rank Inc. The heck with the naysayers. According to Oscar Valdez and Jessie Magdaleno, there are plenty of reasons why fans should buy their Nov. 5 pay-per-view card that will be headlined by Manny Pacquiao challenging Jessie Vargas for his welterweight title at Thomas & Mack Center in Las Vegas. Indeed, there is not as much buzz for this Pacquiao fight as usual. Valdez and Magdaleno are in title fights on the undercard, and when asked why fans should fork over the $59.95 for the Top Rank-produced feed, they let everyone know why this is a worthwhile purchase. “Why shouldn’t they?” Magdaleno said Thursday during a workout at Jackrabbit Boxing Club in Long Beach. “They’ve got great, young talent that’s in that ring. They’ve got myself, they’ve got Jessie Vargas, they’ve got Oscar Valdez – two-time Olympian who is now a world champion. They’ve got great upcoming historical guys who are going to make history in the boxing world, and who are going to put on great shows as the years go on. Magdaleno (23-0, 17 KOs), of Las Vegas, will challenge Nonito “The Filipino Flash” Donaire (37-3, 24 KOs) for his super bantamweight title. Mexico’s Valdez (20-0, 18 KOs) will make the first defense of his featherweight world title when he squares off with Hiroshige Osawa (30-3-4, 19 KOs) of Japan. Valdez put his own colorful spin on why this is a solid purchase. “First of all, you’ve got Jessie Magadaleno,” Valdez said. “Hungry lion, as they say, fighting Nonito Donaire, which, Nonito is still a tough, tough fighter. He’s one of the top fighters out there, so that;s going to be a great, great fight. Me, as a fan, I would love to see that fight. In my case, I’m fighting the WBO ranked No. 1 – Osawa. A lot of people don’t know this guy because he mainly did his career in Japan. But he’s still a tough fighter. I don’t take him lightly at all and I never will take a fighter lightly. There is a fourth world-title fight on this card. It will match Zou Shiming (8-1, 2 KOs) of China against Prasitsak Papoem (39-1-2, 24 KOs) of Thailand for a vacant flyweight title. If Art Hovhannisyan of Glendale stays true to his credo, fans could be in for a good time when he takes on Diego Magdaleno in the junior welterweight main event Friday at Belasco Theater in Los Angeles (on Estrella TV). Hovhannisyan could have his hands full with Magdaleno, a southpaw out of Las Vegas who is 29-2 with 12 knockouts. Magdaleno is the older brother of Jessie Magdaleno, who Nov. 5 will challenge Nonito Donaire for his super bantamweight title on the undercard of the Jessie Vargas-Manny Pacquiao welterweight title fight at Thomas & Mack Center in Las Vegas (on Top Rank pay-per-view, $59.95. World-class boxer Jessie Magdaleno was born in Pomona, but he moved away at age 4 and has since called Las Vegas home. It is therefore appropriate that Magadaleno will fight for his first world title in his backyard. He’ll challenge Nonito Donaire for his super bantamweight belt on the undercard of the Manny Pacquiao-Jessie Vargas welterweight title fight Nov. 5 at Thomas & Mack Center. “It’s a huge opportunity for me,” Magdaleno said this week at an L.A. news conference. That’s for sure. Donaire, of San Leandro via the Philippines, has won world titles in four weight classes. He’s more than likely going to one day be inducted into the International Boxing Hall of Fame. Nevertheless, the undefeated Magdaleno (23-0, 17 KOs) speaks in undaunted tones about this shot. “It’s a big challenge for me, but like I tell everybody, I have this vision and I feel like my age and my speed and my power is really going to overcome him,” Magdaleno said. “I take nothing from him. He’s a great fighter. He’s accomplished what he’s accomplished in the sport. Magdaleno, a southpaw, is just 24. Donaire (37-3, 24 KOs) is 33 and has been in plenty of ring wars. Frank Espinoza, Magdaleno’s West Covina-based manager, intimated his fighter has to go hard all the way through to take full advantage of his youth. For Donaire, he’s stoked about fighting on the same card as Pacquiao for the first time. He also likes where his head is at, and he figures that’s bad news for Magdaleno. This card will be available on Top Rank pay-per-view for $59.95. Longtime promoter Bob Arum on Tuesday played host to a news conference in Los Angeles to formally announce the undercard for the Nov. 5 welterweight title fight between champion Jessie Vargas (27-1, 10 KOs) and Manny Pacquiao (58-6-2, 38 KOs) at Thomas & Mack Center in Las Vegas (on Top Rank pay-per-view, $59.95). Not one to miss an opportunity, Arum closed the proceedings by talking about how alive and well boxing is – contrary to what some think. It wasn’t long ago that an L.A.-area columnist (not from this newspaper) who doesn’t even cover boxing said boxing was dead. While pondering that, just think of all the terrific fighters not from the U.S. or Mexico making a big splash here these days. We’re talking the likes of Gennady Golovkin, Vasyl Lomachenko, Sergey Kovalev, Kell Brook and Carl Frampton to name just five. “We are on the cusp of really a time in boxing where people all around the world will join together to watch our great athletes perform,” Arum said. The main undercard fight for Pacqjuiao-Vargas will have Nonito Donaire (37-3, 24 KOs) of San Leandro via the Philippines defending his super bantamweight belt against Jessie Magdaleno (23-0, 17 KOs) of Las Vegas. Also, newly crowned featherweight champion Oscar Valdez (20-0, 18 KOs) of Mexico will defend his title against Hiroshige Osawa (30-3-4, 19 KOs) of Japan. Finally, Zou Shiming (8-1, 2 KOs) of China and Prasitsak Papoem (39-1-2, 24 KOs) of Thailand will duke it out for a vacant flyweight world title. Diego Magdaleno and his younger brother Jessie took care of business on Saturday at C. Robert Lee Activities Center in Hawaiian Gardens. Diego Magdaleno, 27, ran his record to 25-1 with 10 knockouts with a fourth-round knockout of Jorge Pazos (14-7-1) of Mexico in a super featherweight fight. Pazos is 24. Jessie Magdaleno, 22, is now 18-0 with 14 knockouts after stopping Roberto Castaneda, 22, of Mexico, in the fifth round of their super bantamweight bout. Castaneda is 20-6-1. The Magdaleno brothers are from Las Vegas. The card was televised on UniMas.